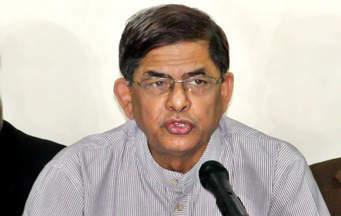 Voicing high hope over foraging a grater national unity, BNP secretary general Mirza Fakhrul Islam Alamgir on Saturday said their chairperson Khaleda Zia gave them a message from jail to make the unity process a success. “We’ve made a good progress over forging the national unity through this rally. We hope we’ll be able to forge the unity very soon under the leadership of the national leaders (Kamal and B Chy) and move forward,” he said. Top leaders of around 30 parties, including BNP, its some alliance partners, Bikolpo Dhara Bangladesh, Jataiya Samajtantrik Dal (JSD-Rob), Nagorik Oikya, and Ganosanghati Andolon, and some civil society members joined the rally. Fakhrul thanked Dr Kamal Hossain and B Chowdhury for taking steps to forge the national unity as the government is trying to establish a ‘one-party rule by destroying democracy’. There is no alternative to forging the unity to get rid of misrule of this government, and remove it from power, he said. He also called upon all to join the movement for realising people’s all the demands. BNP standing committee member Khandaker Mosharraf Hossain said a national unity is very crucial now to restore democracy and ensure good governance in the country. “Let’s get united, irrespective of party and opinion, and move ahead for establishing a pro-people government,” he said. BNP sanding committee member Moudud Ahmed said it will not be possible to oust an autocratic government without forging a national unity. “Today is a new milestone for Bangladesh’s politics as we’ve started a new journey for forging a national unity. “I believe this unity process will be strengthened further in the days to come to unseat the despotic regime by uniting people of all walks of life,” he observed. He also assured that their party will be there with B Chowdhury and Dr Kamal for launching a united movement for the restoration of people’s voting rights.